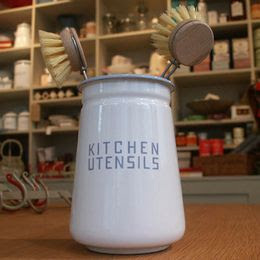 Anyone who cooks much is likely to have a utensil holder sitting out with frequently used items such as wooden spoons. The options here are huge - let's look at just a few. 1. 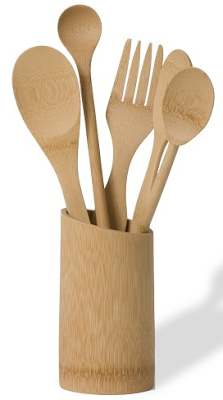 The utensil holder above is made from 100% certified organic bamboo. 2. 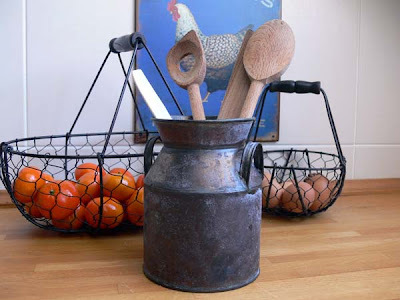 This utensil holder from Le Creuset is a classic. 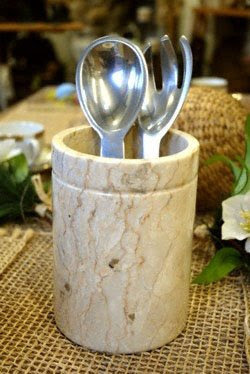 Anther option along the same lines would be the Emile Henry utensil holder, in a range of colors). 3. 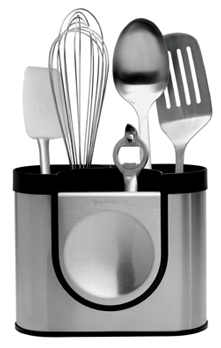 Another common look is stainless steel, nicely represented by this stainless steel utensil holder from simple human. 4. 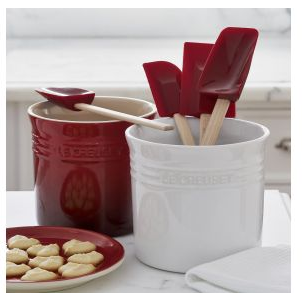 Enamel provides another classic look. Update of Feb. 22, 2012: I'm no longer finding this one. 5. Too boring? The kitschy options are numerous - this was one of my favorites. Update on Feb. 22, 2012: I can no longer find this one, either. 6. OK, maybe that last one was a bit over the top. 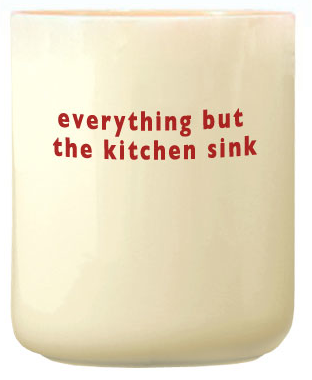 Here's a nice option from the U.K. - other versions say "kitchen sink drams" and "stuff and nonsense." 7. 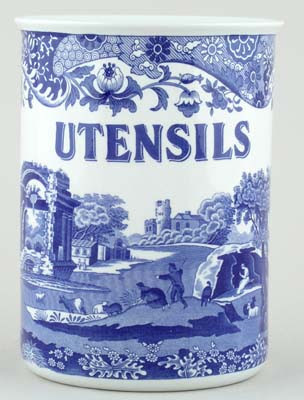 This utensil holder is made by Spode. 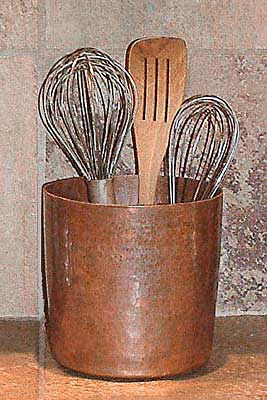 8.Here's a lovely copper utensil jar. 9. 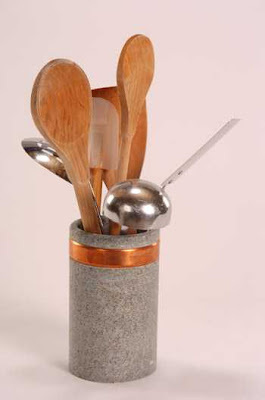 And here's a beautiful one made from soapstone. 10. Marble is another option, shown above - and Corian is an option, too. 11. 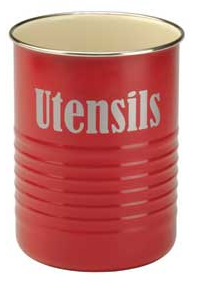 Here's a simple utensil jar, made from enameled steel. 12. And here's one from Deruta, Italy that's not simple at all. Seven patterns are available. 13. 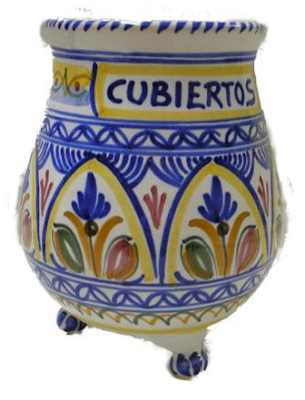 This utensil holder was hand-painted in Spain. 14. 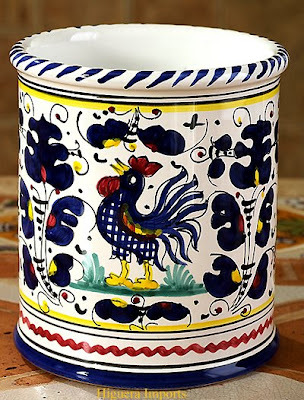 This is a pot à ustensiles from France. Update on Feb. 22, 2012: I'm no longer finding this product. 15. 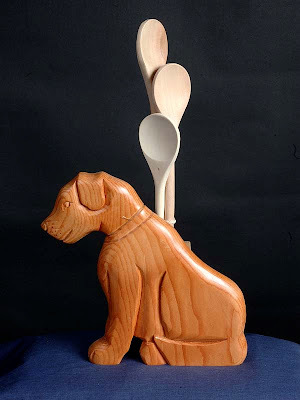 And let's end with one more unusual one, that made me smile; this dog was handcrafted in Canada. Cat and duck options are also available. 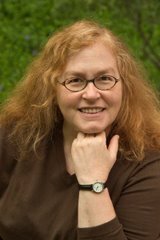 Margaret, I use an oversized mug I bought at a crafts fair - the front is shaped liked the face of Gandhi. That sounds weird, but it's actually a great piece. I'll include a picture in another post - if you send me a picture of yours, I'll include it, too!